This software tour is designed to introduce you to some of the key features of ABC Focus activity based costing system. See how ABC Focus provides a structured approach to cost products, services, processes, activities and unused capacity. It provides a platform on which to confidently adjust pricing and activities for competitive advantage. A realistic estimate of the cost of products, services, customers and unused capacity is able to made quite quickly with ABC Focus. Organizations need reliable costings to achieve both satisfactory margins and satisfied customers. 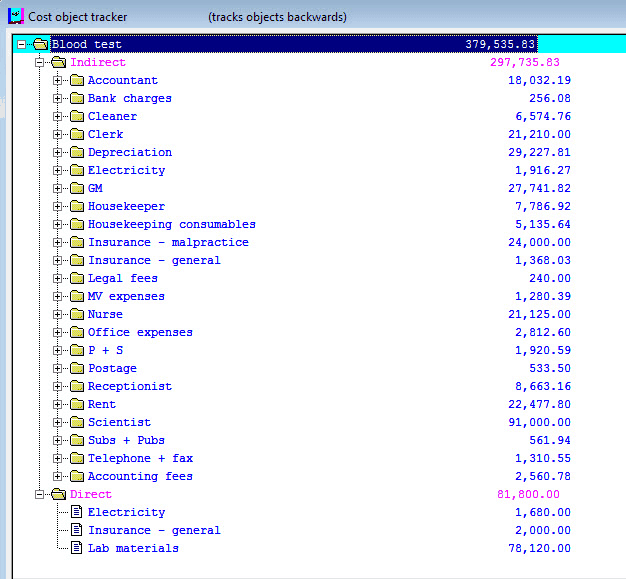 ABC Focus software costs any product, service or process. It also has useful information to improve how the business gets things done. How does ABC Focus work? ABC Focus acts as a guide through the costing and margin evaluation process. It caters for both direct and indirect costs for any organization. It determines costs, margins and efficiencies. This is a new assignment so you will begin a new model. After entering a name for the new model, you see the “map” shown below. Together this is known as a costing model. There can be separate models for each division or company within an organization. The main menu of ABC Focus arranges these components graphically as a map to illustrate how they interrelate. 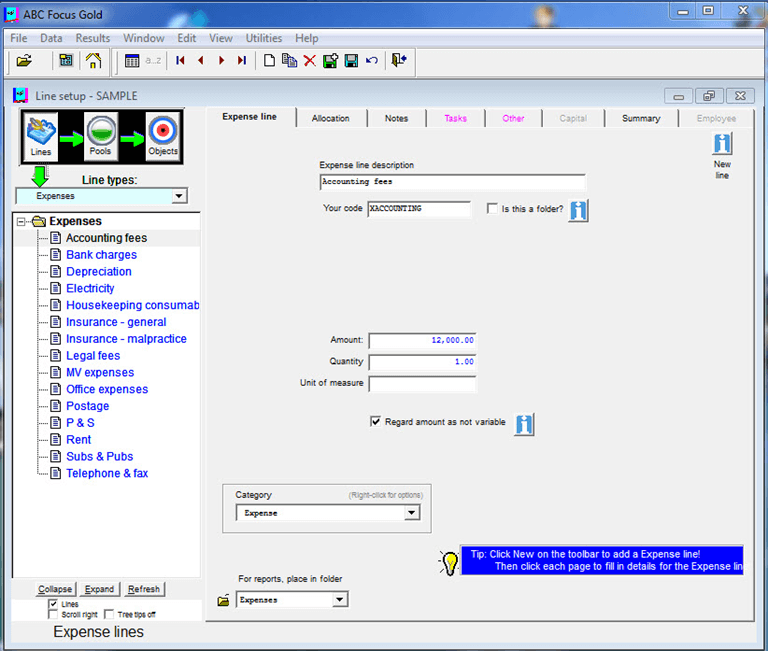 The terms can be altered in the software to suit individual business needs. Use the map (shown above) as a guide when using the software. It is a flowchart of the program. Building a model starts with entering the Revenue and Cost lines. Basically anything from which the entity incurs costs is a cost line. These costs can be broadly divided into Employees, Materials and Expenses. All are accessed from the Enter Lines button on the Map above. The top left of the form above controls the display. 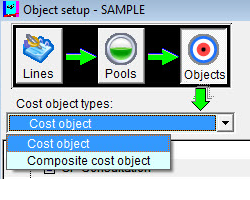 You can choose between cost lines, cost pools and cost objects by clicking the appropriate icon. The green vertical arrow appears under the selected icon. You can drill down further within each section using the drop down menu’s . The choices are shown below. After entering expenses, employees, materials and revenue, the activity cost pools are considered. The pools entered into the software are the activities or tasks performed by the organization in order to produce products or services. The activities that the business does define it – without activities there would be no business! These activities consume resources and hence incur costs. Enter the activities. These would all be entered under Tasks. Any item or activity that you want to cost is a “cost object”. This is the final destination of all costs and revenues. 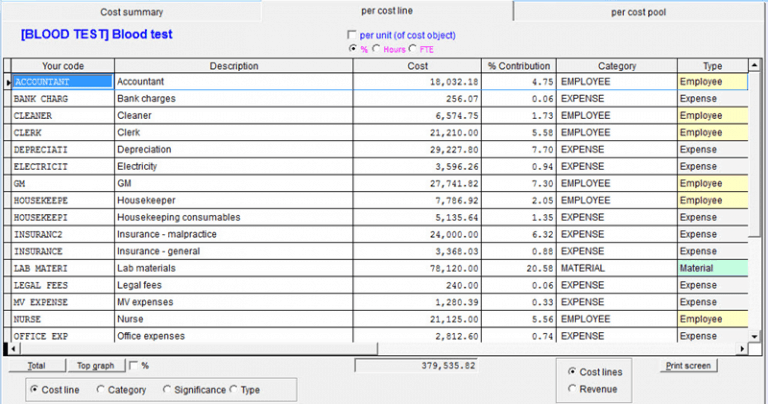 Cost objects are usually products or services, but they can be used to accumulate cost and margin data for analysis of anything such as markets, clients and sales campaigns. In the example below we wish to determine what the cost is to the practice every time a blood test or urine test etc is done. Having entered the revenue, employees, materials, expenses and the activities that the business does, you are ready to finalize the costing model by entering the allocations. First allocate the revenue. Finally, appropriate drivers are selected for each activity cost pool. For example, there may be a cost pool to do with deliveries. An appropriate driver could be the number of deliveries made. 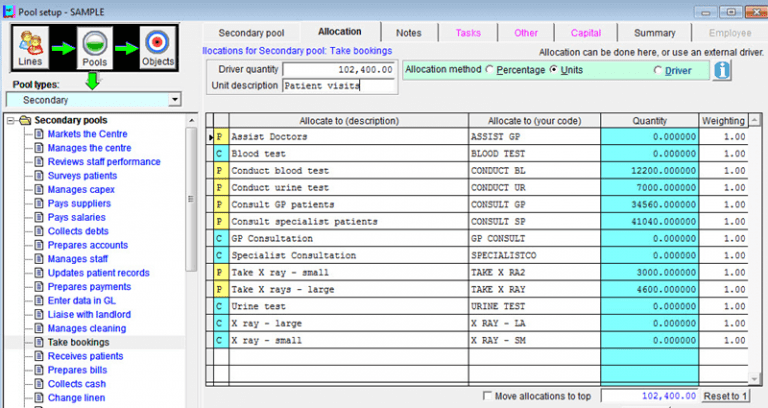 A cost driver called patient visits is entered into the software. 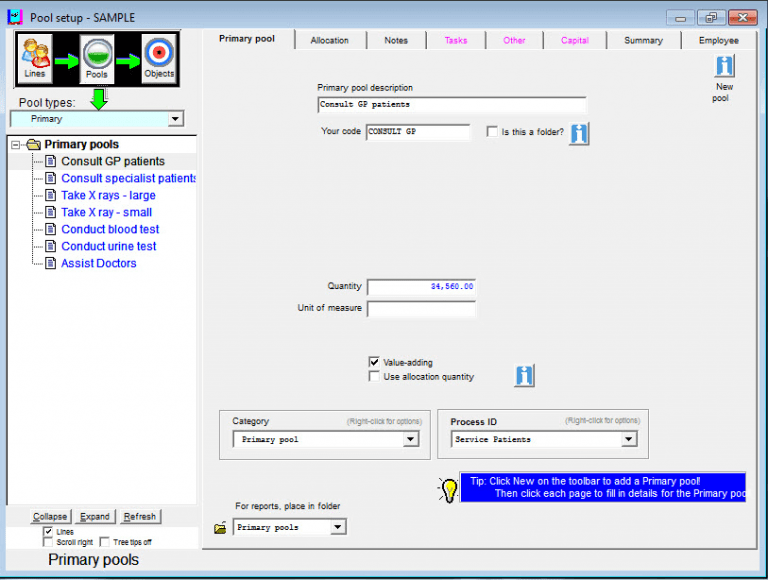 The patient visits driver is assigned to one or several activity cost pools. 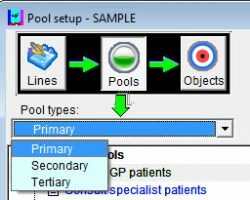 For the medical center example they have activity cost pools called Take bookings and Collect payments that depend on the number of patient visits. So the “patient visits” driver entered above is assigned to them. Often the initial driver will be an estimate – the figures can be improved over time. 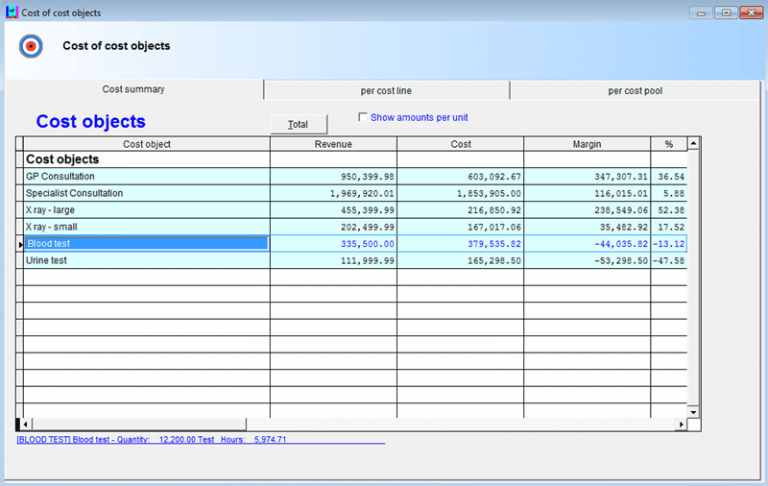 Doing the costing exercise will reveal where more detail is required and this can be added into the model as required. The job is done. It’s now time to let ABC Focus do its work. This organization was surprised to see that they charge less for blood tests than it costs them. Furthermore, the margin on specialist consultations is less than on their general practitioner consultations. Some of their products are profitable, some are losing them money. This shows the components of the costs in order of significance. Now the team can get their thinking hats on to see what can be done. Can the scientist do more tests? Is new technology available to make it cheaper? The software includes extensive reporting, graphing and tree analysis capabilities. Capital is able to be integrated into the ABC Focus model. ABC Focus includes capital costs. ABC Focus provides all the benefits of output based budgeting. ABC Focus monitors costs every month, and compares costs month to month. ABC Focus costs processes as well as activities. 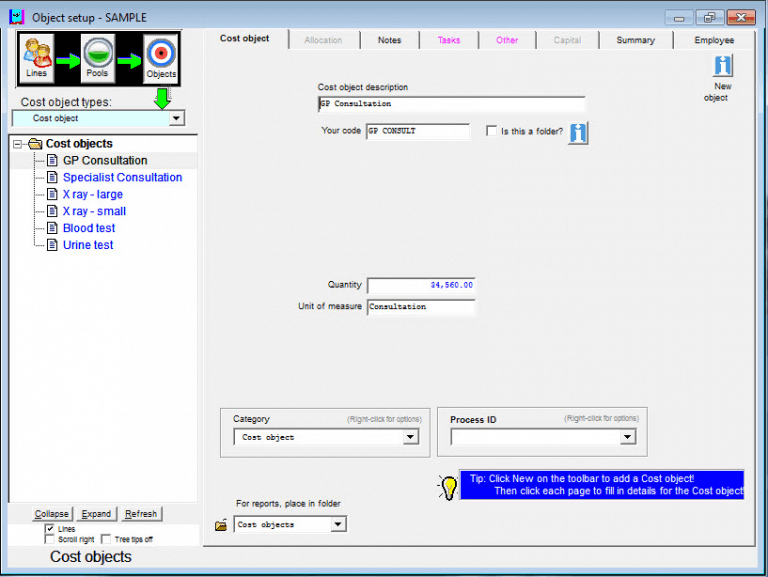 This functionality adds convenience to model mobility with your costings. You may want to save and retrieve models from alternative selected locations possibly for backup purposes or to send a model to someone electronically. Whatever the reason, for these occasions the Zip and Unzip functions are built in to simplify the task and optionally reduce the file size of the model which is handy for electronic transfer. 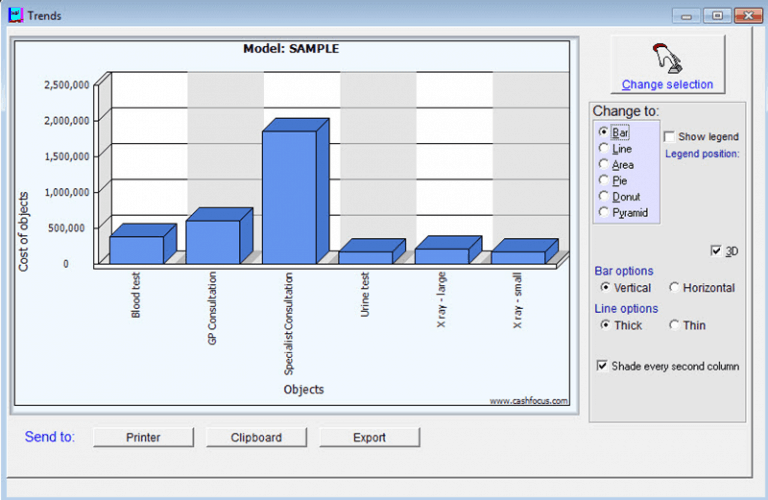 Reports can be printed or exported to Excel, Word and PDF. 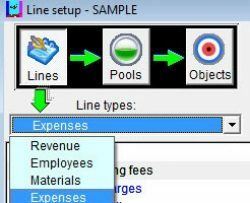 Costings can be imported or exported from any system that has the ability to export / import data to an Excel or ASCII formatted file. 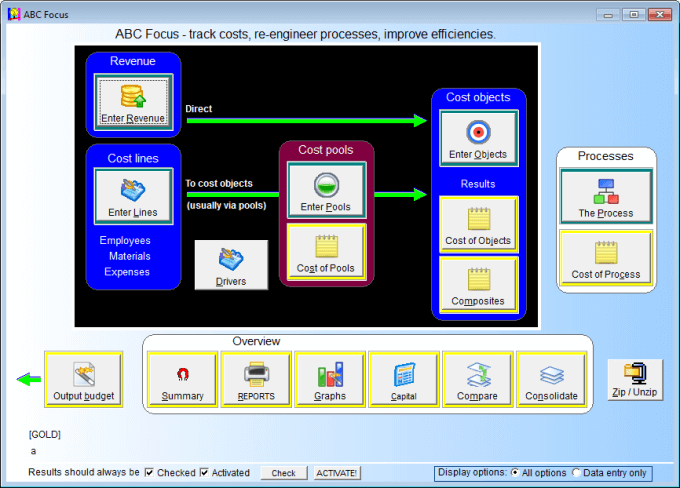 ABC Focus is a tool for costing any product or service. It caters for both direct and indirect costs. If your organization wants to cost services, products or activities for successful business management and for business improvement then ABC Focus is the tool to use. It will guide you through every step from entering the employees, materials, expenses and revenue through to determining the costs of the products, services and activities and evaluating the margins.